Rev. Dr. Eleonora V. Marinaro, ARCWP lives and ministers in Port Richey, Florida through Pastoral Counseling and Spiritual Direction. 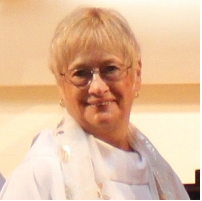 Her sacramental and liturgical ministry is in two small faith communities, where she provides teaching and healing services. She is the author of The Life of the Spirit: In The Convergent Points of Dreams, Spirituality and Psychology, a book about Jungian psychology and spirituality.